← Westport’s New Liquor Store: Have You Heard About The Grapevine? This entry was posted in Environment, Local politics and tagged Jack deVilliers, Regency Centers, Westport Planning & Zoning Commission. Bookmark the permalink. Surely they referenced a raingarden not a rainforest?! I would suggest that a significant donation be made to local charities . Its not just the birds. It is underlying greed that is overtaking our country. Read Ray Dalio article just published in Bloomberg on how capitalism is hurting society, Read about Sloan Kettering top drs in todays NY Times failing to dsclose their conflict of interests. Read about Purdue Pharma and the Sacker Family apparent dishonesty in knowingly releasing a highly addictive oxycontin that will make the Sackler family very wealthy at the expense of hurting so many people. When I hear republicans insult socialism perhaps these concerns may provoke a consideration. Too much greed, from birds to corporations. The parking lot at Fresh Market is in dire need of traffic signs. There should be signs indicating “one way” and “stop”. Lots of near accidents. Many drivers pay no attention to the directional arrows on the pavement. Regency says they consulted with Audubon and Audubon denied it, knowing what the law is. Regency says, “They got it wrong.” No, they broke the law. The ospreys are, as we know migratory. They’re coming back every year, so it’s against the law to block them regardless of what Regency intends to build. When does greed get reined in. The public and the board members did an excellent job voicing their comments and concerns. Regency Centers has been given an opportunity to get this right. 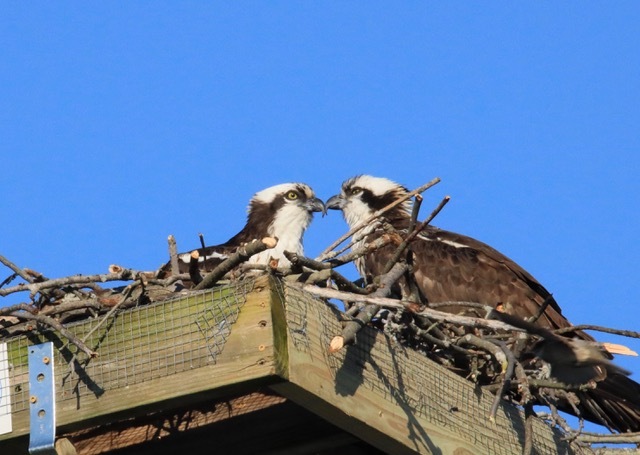 They did not indicate whether or not they would commit to protecting and maintaining an osprey platform going forward. The possibility of a conservation easement requiring that was suggested. There was also enough concern about safety issues with their proposed parking lot changes to warrant a revisit. I look forward to seeing a proposal that addresses these concerns and hope concerned Westporters will attend the next hearing on April 25th. Our voices make a difference. One of the speakers last night mentioned and I think the P&Z folks agreed, that a condition for approval of what Regency is looking for, would be that they are obligated to insure that the nest would stay intact where it is now. They would also do nothing that would cause the Osprey’s to flee the nest. Regency still needs to be charged with a federal crime. It seems some people in this country are charged with crimes and some are not. From where I sat, the sock less, canvassed boat shoed VP of Regency failed to instill any confidence that the company would give a damn about the birds or the town going forward….all apparent bowing and scraping to the contrary. Further, the fawning support given the project by our planning director muddied the waters for clearly seeing major faults with parking, traffic flow, handicap access and landscaping. Let’s hope the applicant’s return appearance presents a more town and bird friendly picture. Lots of folks in Westport are “sock less, canvassed boat shoed.” No need for the ad hominem. Addison, though many may wear canvass boat shoes w/o. Socks, they tend not to for formal presentations to audiences and deliberative, elected boards and commissions. Michael Angelo did not paint the FLOOR of the Sistine Chapel. Hmmmm; I’m not smart enough (young enough?) to know what the “Ward Clever” reference means…..wish I did. Dan, is your “sock less, canvassed boat shoed” comment a form of micro-aggression? Are you judging people based on appearance? Just remember Regency is just another name for Equity one and they have not been very truthful in the past. I doubt they have really changed their stripes. They are good at apologizing only when caught. Have Regency deposit a sizable amount of money – say 4 times the project’s value into a performance escrow account that will be paid back after agreed to milestones are completed to the town’s specification and satisfaction. It is time for organizations like Regency to be held accountable. The only thing these folks truly understand is the wallet. After all they have shareholders, and they are the only group of people Regency is concerned about. So sock it to them so they don’t have to apologize in the future. Yes, with hat in hand, Regency made an apology but, like Ms. Dobin, a P&Z commissioner, I too question whether the platform would have been replaced if they weren’t scheduled to be appear before the P&Z last night. Don’t know the answer to that but do know that there was no mention of preserving the pole, the platform and the nest as part of their “green” (yes, ironic) plan presented at the P&Z meeting last night. With ospreys sailing overhead, they chose to remove the platform and nest in the wee hours of a Saturday morning when government agencies that enforce the protection of migratory birds were closed. As for Ms. Walsh’s suggestion that they make a donation to an organization, rather than a donation be made to a national organization that did nothing to alert the public and local town officials about Regency’s plans when contacted, what about Wildlife in Crisis that for many years has been rehabbing and assisting wildlife that are victims of “we meant well” deeds committed by individuals and organizations in this area. Look forward to receiving answers to questions at the public forum that Regency is reportedly scheduling. Thank you Dan for your continued updates. Can we name the Ospreys James and Colleen in honor of our outgoing Superintendent of Schools Colleen Palmer and SHS Principal James D’Amico? You know, the two major education positions we have in town related to our children, town rep, and real estate values. I’m very happy the Osprey situation was resolved positively. Not sure the bloodthirsty calls for vengeance toward Regency would be constructive. But I do know getting the education leadership in order vs. our most recent, failed attempt would be hugely helpful to many in the town, including a generation of children who will be raised here. Hopefully this topic generates a similar amount of energy and attention as the ospreys. I can’t even believe so much attention is being paid to this issue when there are so many other more important issues that face all of us, including what Mark Post outlines regarding our schools.. Priorities, people, priorities. The last I checked, Regency owned this property and is free to do what they want with the pole and with the nest. It’s one thing to express your displeasure with their action but it’s another to try to force business owners to act the way you might. If the nest were your backyard and you made the same decision, you would not take kindly to neighbors trying to make you do something you did not want to do. They cannot do as they please with the pole and nest. There are both federal and state laws. The birds had already returned. Also as other commenters have pointed out, they have not fulfilled P&Z directives/promises they entered into before. So where does it end? Should we let companies walk all over and “do as they please” when it breaks agreements and laws? Even once they get caught, should we simply let them off with an apology instead of asking them to make good on their previous agreements? Priorities, people, priorities. We can handle several priorities at one time. The school leaders decided to 1. retire and 2. seek employment in his hometown. The process for selecting replacements is underway. We will attract appropriate replacements who will continue to lead our school system. Much is said about maintaining our town character. Allowing bad behavior from corporate owners will not help us maintain our character – priorities, people, priorities. Newly approved archery range at the YMCA?! Only a matter of time before a stray arrow kills one of our beloved ospreys. Outrageous. Jay Summers, it is because of people like you, who think private ownership entitles one to do as they please that tight laws protecting others from your would be wonton anti social and possibly illegal actions are so vitally necessary. Absent land use abuse, zoning laws would be unnecessary. classic greed, ,classic republican response. Its not local. Society is being harmed by such greed and ignorance. The Trump administration is destroying the earth . The republicans are drilling on formerly protected lands. Global warming is a hoax. You know who says global warming is a serious problem? Israel, The USA Pentagon, USA military,among almost every rational country in the world. Count Jay and the USA out. I assume that the antique grey house on the Terrain property belongs to the same owners. Poor maintenance is allowing this charming house to deteriorate. It appears that it is being used haphazardly for random storage. This is a question that should be addressed immediately.